With the fantasy hockey playoffs rapidly approaching, fantasy managers have limited time to snag a piece that might greatly impact their playoff run. For the next couple of weeks, Fred Poulin, Peter Harling, and myself, Anatoliy Metter, will be evaluating some trending players that could make or break one’s fantasy season. Which centreman (if available) will have the biggest impact for the fantasy playoffs? 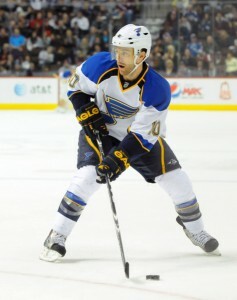 Fred Poulin: Owned in only 30% of Yahoo Leagues, veteran centre Andy McDonald will be very useful down the stretch. Since coming back from his concussion on February 12, McDo has 8 goals and 7 assists for 15 points in 15 games for the surging St. Louis Blues. He also has 2 game-winning goals and 37 shots of goal during that stretch. What is even more interesting is that McDonald is also eligible at LW! Don’t forget he had 50 points in 58 games last season, so he is a reliable point producer. Peter Harling: Due to the fact he was buried behind Henrik Sedin and Ryan Kesler in Vancouver Cody Hodgson is only 18% Yahoo! fantasy owned. In Buffalo he is slotted in the second line center position between Drew Stafford and Tyler Ennis who are both hot having combined to score 10 points in the last ten games. Ryan Miller has returned to form and the Sabres are surging. Bet on Hodgson to begin producing on a regular basis. Anatoliy Metter: At only 27% owned in Yahoo! leagues, I have to go with Montreal Canadiens center David Desharnais. Desharnais has posted solid numbers throughout the season and is showing no signs of a let down as he has registered 8 points (3 Goals, 5 Assists) in his last 6 games played. Desharnais is currently battling with a lower body injury, but he is day-to-day and should be back in the lineup soon. Montreal’s top line center might not get many shots on net, but he will dish the puck out to his teammates and capitalize on a scoring opportunity when he sees one. If you play in a league that has Desharnais out in the free agent pool, then feel confident in picking up the center for the fantasy playoffs. Which available winger can help owners the most during the fantasy playoffs? Fred Poulin: Right winger David Jones of the Colorado Avalanche has been playing fairly well since the All-Star break, notching 7 goals and 8 assists in 17 games. Owned at a mere 8%, you’re almost certain to be able to grab him for the playoffs. Don’t forget that Jones scored 27 goals last season in 77 games with the Avs and he has found chemistry with newly-acquired forward Jamie McGinn and Paul Stastny on the team’s first line. Peter Harling: Peter Mueller missed all of last season and most of this one. As a result he is a measly seven percent yahoo owned. In the 22 games he has played in this season he has twelve points, including five in his last four (1 Goal, 4 Assists). Chances are Mueller is available and at 0.5 points per game he provide enough scoring to give you an edge. Anatoliy Metter: Right winger Drew Stafford of the Buffalo Sabres has been dominating the opposition as of late. It is obvious that Stafford likes playing with Tyler Ennis and it is showing as Stafford has tallied 4 points in his last 10 games. On the other hand, Tyler Ennis has posted 2 goals and 4 assists in his last 10 games and a +1 rating. Stafford and Ennis are 37% and 30% owned in Yahoo! formats, respectively. As long as both of the aforementioned players keep up their good chemistry, fantasy owners stand to benefit the most. Is there a steady point producing defenseman available on the waiver wire? Fred Poulin: Trevor Daley, only owned at 7% in Yahoo! leagues, makes a nice pick-up for the red-hot Dallas Stars who have been 7-1-2 in their past ten games. Daley has 5 assists in his last 8 games with a +5 rating, 4 PIM, and 10 shots on goal. The speedy blue liner sees time on the Stars’ second PP unit, so as long as the team is winning games, Daley should produce at a very good pace. Peter Harling: Ryan Ellis is 5% Yahoo! fantasy owned, and therefore should be available. Why should you consider him? He has nine points in 25 games with Nashville this season. He missed some games as he was ill, and no doubt played some games at less than 100%. He was recently recalled and Coach Barry Trotz said he expects Ellis to remain with the Predators for the balance of the season. Ellis is a supremely offensively talented defenseman on the verge of fantasy greatness. Anatoliy Metter: At 9% owned in Yahoo! leagues, Justin Faulk could help fantasy owners out big time during the playoffs. Faulk is only a rookie, but he has been seeing increased time on the power-play and has recently taken time away from the likes of defensemen such as Jamie McBain. In his last 10 games, Faulk has 5 points (3 Goals, 2 Assists) and has a neutral rating, something that shouldn’t be frowned upon as he plays for the Hurricanes. Faulk has only 19 points on the season, but he is impressing in his rookie campaign and is one of the few bright spots on the Carolina Hurricanes team. Which goalie (Varlamov, Hackett, Bishop, Emery, or Dubnyk) will have the biggest impact during the fantasy playoffs? Fred Poulin: Semyon Varlamov has finally found his groove with the Avalanche after a rough start. 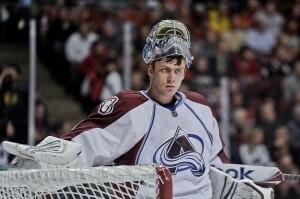 In his last 6 starts, Varly has 4 wins, 1 shutouts, and has only allowed more than 2 goals in one of those matchups. On the season, he has a fairly decent record going 21-20-2 with a .910 save % and a 2.64 GAA, numbers that should improve until the end of the season as the Avalanche have been playing much better hockey lately going 7-3 in their past 10 games. Peter Harling: Semyon Varlamov and the Colorado Avalanche are currently in a three way tie for the final playoff position in a very tight Western conference. The Avs are 7-3-0 in their last ten games. The strong play of rookie Gabriel Landeskog, and Peter Mueller is part of their recent success. The recent additions of Jamie McGinn and Steve Downie are also paying dividends. But the play of Varlamov has been spectacular. In his last ten games Varlamov has a 7-3-0 record, a GAA of under 2.00 and a Save Percentage of .941. Anatoliy Metter: I have to go with Ray Emery on this one as he has been a boulder behind the crease for the Chicago Blackhawks. Emery is only 21% owned in Yahoo! formats, but he strung together 3 straight victories before falling 5-1 to the St. Louis Blues and has helped the Blackhawks gain 3 out of a possible 4 points since then. With a 15-9-3 record and a .906 Save Percentage, Emery can help some fantasy owners who have quirks in goal that need to be worked out. Emery presents owners with a very low risk pickup and high reward potential as he is more than capable of stealing a win for the Blackhawks as well as fantasy owners.